In the year 2000, we built and moved into a new building. It has allowed us to computerize and connect the various departments, providing us increased predictability, efficiency and quality. Take a look at our gallery of photos. We continue to invest in new equipment, new methods and our people. If you are in our area, please call ahead at 503-792-3696. We’re always happy to show you our facilities. 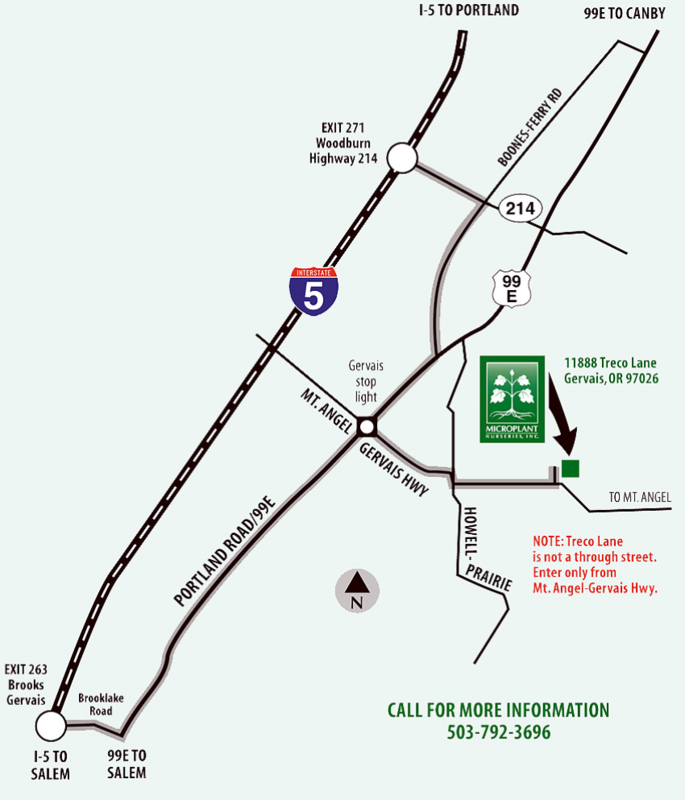 DRIVING DIRECTIONS We’re located in the heart of Oregon’s Willamette Valley, less than 20 miles from the state’s capital, Salem. Use these driving directions to find us whether you’re traveling from the north or south. Please note that mapping programs and GPS information may be inaccurate due to our private road, Treco Lane; refer to the map below, or download a PDF. 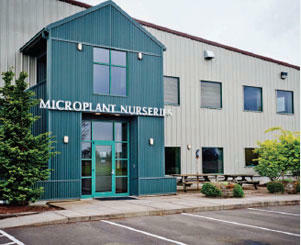 Mircroplant Nurseries, Inc. 11888 Treco Lane Gervais, OR 97206 503-792-3696 From I-5 traveling NORTH take Exit 263 (Brooks/Gervais) to Brooklake Road heading east. At Brooks stoplight intersection, turn left onto Portland Road/99E. Travel north 4.8 miles to Gervais stoplight intersection. TURN RIGHT onto Mt. Angel-Gervais Hwy. Travel east 2.7 miles to Microplant Nurseries on left at Treco Lane. From I-5 traveling SOUTH take Exit 271 (Woodburn/Hwy 214). Travel one mile on Hwy 214 to Settlemier Avenue, and turn right. Continue one mile to railroad tracks. Street name changes to Boones Ferry Road; continue 1.5 miles to Portland Road/99E and turn right (Exxon gas station on corner). Proceed 1.1 miles to Gervais stop light. TURN LEFT onto Mt. Angel-Gervais Hwy. Travel east 2.7 miles to Microplant Nurseries on left at Treco Lane. NOTE: Treco Lane is not a through street. Enter only from Mt. Angel-Gervais Hwy.